We understand you want to get your answer quick by our experts. Therefor we reply as soon as we are able, usually within an hour. Castrol Power 1 RS 2T (2-stroke) Hot! Castrol recommends your motoroil type by using your license plate or car brand and model. Copy paste the motoroil name in the search box and your are ready to order! For every application we do have the solution with foodgrade Fuchs Cassida. Our foodsafe specialist is looking forward to assist you. OlieOnline supplies only quality Lubricants. Mobil was missing in the key quality brands. Behind the scenes, we work hard to also offer the Mobil range for you. In the coming period, you will see more Mobil products appear here. If you want to order a product we can deliver everything. Request your Mobil product here. OlieOnline supplies only quality Lubricants. Q8 has a wide range of lubricants, coolants and ATF fluids. We can offer you the full range of Q8 oils. Can't you find the product you are looking for? No worries just ask us and we make the offer for you. In the near future you will see more Q8 products appear here. Request your Q8 product here. What kind of oil are you looking for? > Do you need help finding the right oil? Castrol Hyspin AWS 22 has been specially formulated to provide good anti-wear and thermal stability performance using proven additive technology. The careful blend of additives with a high quality base stock ensures that Castrol Hyspin AWS 22 has excellent hydrolytic and oxidative stability while exhibiting a minimal tendency to produce sludge and deposits. Your advantage! Price of CASTROL HYSPIN AWS 22 drops automatically in larger quantities. Castrol Hyspin AWS 46 has been specially formulated to provide good anti-wear and thermal stability performance using proven additive technology. The careful blend of additives with a high quality base stock ensures that Castrol Hyspin AWS 46 has excellent hydrolytic and oxidative stability while exhibiting a minimal tendency to produce sludge and deposits. Your advantage! Price of CASTROL HYSPIN AWS 46 drops automatically in larger quantities. Castrol Hyspin AWS 32 has been specially formulated to provide good anti-wear and thermal stability performance using proven additive technology. The careful blend of additives with a high quality base stock ensures that Castrol Hyspin AWS 32 has excellent hydrolytic and oxidative stability while exhibiting a minimal tendency to produce sludge and deposits. Your advantage! Price of CASTROL HYSPIN AWS 32 drops automatically in larger quantities. Castrol Hyspin AWS 68 has been specially formulated to provide good anti-wear and thermal stability performance using proven additive technology. The careful blend of additives with a high quality base stock ensures that Castrol Hyspin AWS 68 has excellent hydrolytic and oxidative stability while exhibiting a minimal tendency to produce sludge and deposits. Your advantage! Price of CASTROL HYSPIN AWS 68 drops automatically in larger quantities. Hyspin HVI 22 oils are intended for severely stressed hydraulic systems requiring a high level of anti-wear performance and fine filtration. In addition, Hyspin HVI 22 exhibits excellent corrosion protection as well as outstanding thermal and oxidative stability. Hyspin HVI 22 has excellent hydrolytic stability and separates rapidly from water contamination. Hyspin HVI 22 contains a shear stable additive system which helps to maintain the viscosity characteristics of the product over a wide temperature range, even during prolonged use, and imparts a very low pour point which enables the product to be used in cold environments. Your advantage! Price of CASTROL HYSPIN HVI 22 drops automatically in larger quantities. Hyspin HVI 32 oils are intended for severely stressed hydraulic systems requiring a high level of anti-wear performance and fine filtration. In addition, Hyspin HVI 32 exhibits excellent corrosion protection as well as outstanding thermal and oxidative stability. Hyspin HVI 32 has excellent hydrolytic stability and separates rapidly from water contamination. Hyspin HVI 32 contains a shear stable additive system which helps to maintain the viscosity characteristics of the product over a wide temperature range, even during prolonged use, and imparts a very low pour point which enables the product to be used in cold environments. Your advantage! Price of CASTROL HYSPIN HVI 32 drops automatically in larger quantities. Hyspin HVI 46 oils are intended for severely stressed hydraulic systems requiring a high level of anti-wear performance and fine filtration. In addition, Hyspin HVI 46 exhibits excellent corrosion protection as well as outstanding thermal and oxidative stability. Hyspin HVI 46 has excellent hydrolytic stability and separates rapidly from water contamination. Hyspin HVI 46 contains a shear stable additive system which helps to maintain the viscosity characteristics of the product over a wide temperature range, even during prolonged use, and imparts a very low pour point which enables the product to be used in cold environments. Your advantage! Price of CASTROL HYSPIN HVI 46 drops automatically in larger quantities. Hyspin HVI 68 oils are intended for severely stressed hydraulic systems requiring a high level of anti-wear performance and fine filtration. In addition, Hyspin HVI 68 exhibits excellent corrosion protection as well as outstanding thermal and oxidative stability. Hyspin HVI 68 has excellent hydrolytic stability and separates rapidly from water contamination. Hyspin HVI 68 contains a shear stable additive system which helps to maintain the viscosity characteristics of the product over a wide temperature range, even during prolonged use, and imparts a very low pour point which enables the product to be used in cold environments. Your advantage! Price of CASTROL HYSPIN HVI 68 drops automatically in larger quantities. Castrol Hyspin HVI 46 D also incorporates lubricity additives to give smooth slideway motion on the combined hydraulic and slideway lubrication systems of some grinding and gear cutting machine tools. Castrol HLP-D fluids contain detergency additives which maintain dirt and oil oxidation products in suspension, preventing them from settling out and forming deposits which could impair the free operation of valves, leading to erratic system operation. Machine tool manufacturer's are increasingly specifying HLP-D fluids such as Hyspin HVI 46 D, having recognised their advantages in increased system reliability. Your advantage! 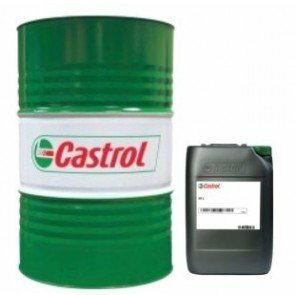 Price of CASTROL HYSPIN HVI 46 D drops automatically in larger quantities. Castrol Hyspin AWS 15 has been specially formulated to provide good anti-wear and thermal stability performance using proven additive technology. The careful blend of additives with a high quality base stock ensures that Castrol Hyspin AWS 15 has excellent hydrolytic and oxidative stability while exhibiting a minimal tendency to produce sludge and deposits. Your advantage! Price of CASTROL HYSPIN AWS 15 drops automatically in larger quantities. Ian Adair "We like your site, it shows that you are experts in lubricants!" Cris Scullion "You deliver quicker than our previous UK supplier!" Stuart Wyatt "Surprise to us! We paid to much in the past"
Copyright 2018 OlieOnline.co.uk is part of OlieOnline.com BV. All rights reserved.